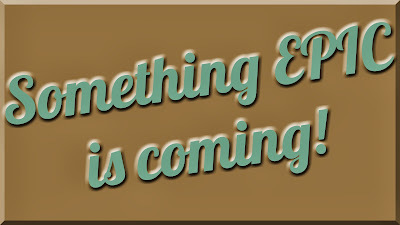 Something Epic is coming! Kathy Orta-Files of Paper Phenomenon, Kathryn Krieger of Kathryn Scraps and I are blog hopping this week with Part 2 of our Epic house series. Remember there is an Awesomely Epic Announcement on Thursday that will be made live at 9:00 p.m. Eastern/8:00 p.m. Central on Thursday, October 10, 2013! Click here to bookmark the link: https://www.youtube.com/watch?v=l0iaerkzDAc. So, make sure you check out our blogs this week as we will each be featuring a 3-step tutorial on how to make a decorative house that would be awesome in a set when completed. Make sure you check back to each of our blogs this week for more steps on making these GREAT houses and for an Epic announcement on Thursday! Good morning Jim!! Do we enter every day or just once?? looks like you have a new list of name this morning?? This is such a fun project! I'm temporarily stuck because I want to use a bottle brush tree also and don't have any. I have my pieces cut and ready to go tomorrow after I do a little shopping. Actually, I had fussy cut pieces last year and never used them--waiting for this project I guess. I so appreciate your thorough demo--it is so helpful. Wonderful project. Watched vid # 1 and found it easy to follow. Thanks. On pins and needles over this epic announcement! With the three of you teaming up it can't be anything less than epic. I think I need to go out get some of those trees. Thanks for the tutorial. This is lots of fun. I'm loving the projects, but today, the link to Kathryn's blog isn't working. Hope someone can fix it. I'll check back later. Thanks. Yikes... I missed getting linked up on this one! Darn it! Well I still love your Christmas house... you video is fabulous! On to the next post! Have a wonderful day!! !